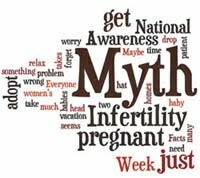 Today I am participating in the Bust an Infertility Myth Blog Challenge, a National Infertility Awareness Week® blogging event sponsored by RESOLVE: The National Infertility Association. As I've mentioned in my blog post about the Livestrong Young Adult Alliance, one of the issues facing childhood and young adult cancer survivors is infertility. The radiation and chemotherapy treatments that save so many lives unfortunately deprive many cancer survivors the opportunity to become biological parents. I know this because I am one of many cancer survivors who is unable to have children. When I signed a consent form for my cancer treatment, it clearly stated that infertility was a common side effects of the treatment I was choosing. As much as I wanted to start a family one day, in that moment I needed to focus on treating a cancer that had a 67% chance of killing me. Back in 1988, there were no fertility preserving options available to me. Even if there were, my cancer had progressed to the point where it needed to be treated immediately and could not wait for me to preserve some of my eggs. After I completed chemotherapy in August of 1988, I experienced premature menopause. That led to a series of consultations with several different gynecologists to talk about approaches to managing this situation. An unexpected part of those consultations was listening to advice about how I might be able to become pregnant in the future if I so desired. Unfortunately for me, getting pregnant was the furthest thing in my mind at that time. For starters, I had been dumped by my boyfriend a month after my cancer diagnosis and didn't think that dating was going to be part of my immediate future. I was also dealing with some body image issues that were the result of the aftermath of my cancer treatment and subsequent premature menopause. Plus having just finished chemotherapy, I couldn't quite imagine wanting to subject myself to more medical procedures anytime in the near future. When I finally found a gynecologist I felt comfortable with, I started on hormone replacement therapy (HRT). I remained on HRT for about six years until something strange happened on the day of the Northridge earthquake, January 17, 1994. In response to the earthquake, I got my period. In and of itself, that wouldn't have been very remarkable, except for the fact that I was in the wrong phase of my HRT to be getting my period. Which led to the discovery that my cycles had returned on their own and after a few months I discontinued HRT. Which brings me to the infertility myth I am busting in this blog post: just because you are having regular periods doesn't mean you can get pregnant. Despite full disclosure of my cancer treatment history to my gynecologist, she told me when my period returned that I could get pregnant. Because infertility has been one of the hardest things for me to accept in my life post-cancer, I grasped onto this hope and let myself believe that what she was saying to me could be true. I became reacquainted with the truth when I was finally ready to start family building with my husband and found myself unable to get pregnant after months and months of trying. I am sure that the infertility doctors I consulted thought it was a bit strange that I was so upset with their diagnosis in light of the information I shared with them about my cancer history and treatment. It wasn't that I was upset about being told that I was infertile; I was upset because I let myself believe for so many years that I was not. Today I am choosing a life without children. I still wish that I could have children, however I feel that in my current situation, dealing with several chronic and disabling medical problems, it is impossible for me to be a "good enough" mother at this time. It is my hope that one day my health will get better so my husband and I can pursue adoption as our family building option. Until then, we offer our home to a collection of homeless pets seeking "furever" homes and lavish them with the love and attention we are able to offer. To learn more about the real truths about infertility, visit RESOLVE today. Click here learn more about National Infertility Awareness Week®. There is nothing comforting or supportive to say, when the very crux of this is the acknowledgment of a loss from which you can never recover. Like a death, a divorce, a tragic disaster, it's impossible for someone who has never experienced it to have the "right words". I can only say that I admire you so much for having the courage to talk about your pain, and that I pray for you to have a peace-filled life of contentment and good health. If it's true that we are rewarded for the good we do, you have many rewards awaiting you. Love you! *hugs* Thank you for sharing your story. You are an awesome pet mom!!! Thank you so much for sharing this story! I think with full disclosure of cancer treatments we all think of the alternative of death rather than the not so great side effects we get to live with for many many years if the treatments work. That was a very stupid thing for your gyno to say about being fertile. Maybe she had not seen young cancer survivors before?? Hugs. I'm so sorry for all that you have had to go through. We suffered from infertility for over five years. Had to go through every treatment possible, but I know this is nothing compared to battling cancer. Good luck to you in the future!